The novel is clearly for those who are already familiar with the earlier Jokka short stories. Fortunately, Hogarth collected them together two years later into Clays Beneath the Skies; cover-described as, “Seven short stories from the world of The Worth of a Shell”. Readers unfamiliar with the Jokka are advised to begin there. The stories of Clays Beneath the Skies were written from 2001 to 2010 (the Chronology lists two more set earlier than The Worth of a Shell but not published until after Clays). They are arranged by internal chronological order, not the order in which they were published. This is fortunate, because they are exotic enough as it is. They are presented as if narrated by one Jokkad (Jokka singular) telling his/her/its story, assuming that his/her/its (for simplicity’s sake I will just use “his”) listeners will understand his cultural background. 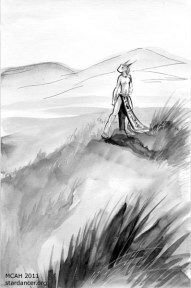 The seven stories cover generations, during which the Jokka evolve from migratory nomads to sophisticated town-dwellers, to a slow decline as Ke Bakil’s climate becomes increasingly arid and resources are used up. The narrator is Kediil, born anadi, a female, but turned eperu, a neuter, with the first of the Jokkad’s two puberties, therefore retaining its intelligence; unlike the anadi who slowly become dumb animals after the physical trauma of pregnancy. The emodo, the physically strong but mentally fragile males, also risk losing their intelligence if they are subjected to excessive stresses such as extreme exhaustion or terror. The eperu, not subject to mind-loss, are the nomadic clans’ healers and teachers, their accumulated memory – the lore-knowers. Kediil eventually learns one bit of medicinal lore that the eperu keep a close secret. There are plants that, if eaten by an anadi or emodo, will prevent mind-loss – at the cost of rendering them sterile. To keep the two breeder sexes from saving their intelligence but dooming their clans to die out from sterility, the eperu have withheld this knowledge from the fertile genders. How this knowledge affects Kediil makes the story. Daridil was atypical for our kind: he’d remained male through both puberties, and it showed in the adult. Tall and limber, he had the emodo’s long fingers and flexible toes, perfect for complex and delicate work. His wedge-shaped head had a handsomely blunt end that complemented the triangular ears with their dark tufts. He was in some ways too perfect, for the family tended to overlook his mind while praising his body. “A Trifold Spiral Knot” is set in and around Dardenil, the largest of the Jokka’s new mud-brick permanent towns. It is narrated alternately by the mystic Erdiil, who has been emodo, anadi, and eperu; and Mayiin, who has traveled for years to meet it. The Jokka begin developing a religion. The four remaining stories (“Money for Sorrow, Made Joy”, “Unspeakable”, “His Neuter Face”, and “Fire in the Void”) relate the spread of towns, and the development of trade caravans to connect them; the evolution of urban life (notably the growth of clans into prestigious Houses) and the formalization of the religion; and the effect on all of them as the land of Ke Bakil dries up. Each story is told in the first person through a new narrator, and develops its background against a foreground interplay of the triple genders. A back-cover blurb quotes a reviewer as saying that the stories in Clays Beneath the Skies are “Strongly reminiscent of the work of Ursula LeGuin”, and they certainly do fall into that school of social s-f featuring non-traditional sexual themes. This collection includes a chronology and a glossary of Jokka vocabulary. 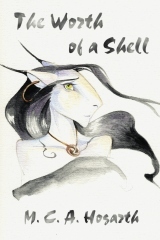 The Worth of a Shell, the Jokka novel, is chronologically the last of the stories (so far). 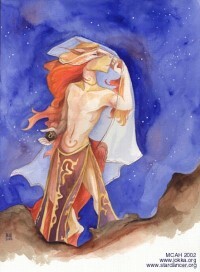 The narrator is Thenet, the jarana of House Mated in the large town of Serean. A jarana is an anadi-guardian, an eperu so skilled that it is able to keep a House’s head anadi from losing her intelligence after giving birth. (Such anadi are the kaña-befidzu.) 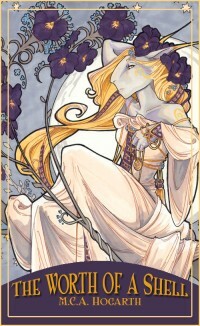 Thenet is tasked with caring for Kerdil, Mated’s kaña-befidzu – essentially the House’s prize female, valued as a breeder. As the novel opens, Kerdil is expecting her second childbirth soon, which does not worry anyone; Thenet will ensure that Kerdil’s mind is not lost during childbirth, and Mated’s healer will ensure that the baby is born safely. Kerdil dismisses Thenet to enjoy Serean’s Transactions Fair; an enjoyable holiday before it must assist at the anadi’s childbirth. But Thenet returns from the Fair to find Kerdil in the throes of a premature birth, when the House healer is also absent. The child is stillborn despite Thanet’s efforts to save it, and the distraction destroys Kerdil’s intelligence as well. Thenet is blamed for both losses and exiled from House Mated – effectively sentenced to death, since as a castoff it is outlawed and cannot expect to be taken in by any other House in Serean. But bearing children is a duty we reward the anadi amply for. They are showered with jewels and scarves made by the emodo, zealously guarded and provided for by the eperu, allowed to live a life of leisure in rooms with pools of water to keep their skin smooth and cool and servants to offer them flavored waters and candied meats. A life of pleasure and purpose. 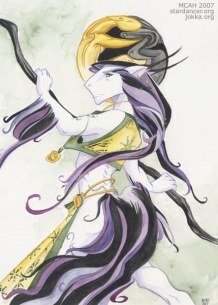 Thenet and Dlane are only two-thirds of the Jokka triad. As far as they are concerned, they need an emodo like, to use the very out-of-place modern American idiom, “a fish needs a bicycle.” But the novel does need an emodo to become complete. 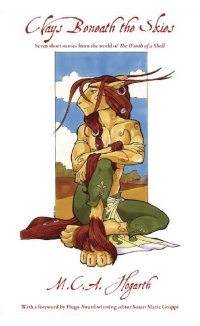 He is Roika, who wanders in and out of the story for his own purposes, but who turns out to be as unorthodox for an emodo as Thenet and Dlane are for an eperu and an anadi. The Worth of a Shell is a long novel, blending the elements in the individual stories of Clays Beneath the Skies into a more complex whole. It is easy to see why, after completing this, Hogarth went back to write more tales of the Jokka’s past. Will there be any stories set after The Worth of a Shell to tell of the Jokka’s future? Review copies were provided by the author.